THIS June, Tjin Lee, founder and managing director of the Mercury group of companies, is moving her public relations and marketing & communications (M&C) teams to the co-working space at The Work Project at OUE Downtown Gallery. Incidentally, Lee herself is the co-founder of a co-working space called Trehaus, which is said to be Singapore’s first family-friendly co-working space as it offers child-minding facilities for parents while they work there. However, she is not moving her PR and marketing teams into Trehaus as it does not have the space to accommodate them, she says. Even though she continues to maintain a second office on Henderson Road for her events company, Mercury Live, which has around 25 staff, Lee estimates that she still enjoys cost savings of 40% by moving into the co-working space. The Work Project’s Lee cites CBRE’s Occupier Survey in March, which said that 52% of MNCs in Asia-Pacific consider workplace ­strategy their No 1 priority and are seeking to invest more in space efficiency programmes. For example, Australian-listed property group Lendlease will be moving 100 workers in its Asia-Pacific headquarters, including its CEO for Asia, to the co-working space at The Work Project at OUE Downtown Gallery. This co-working space has expanded to 24,000 sq ft, from 20,100 sq ft last December. The space — with a capacity for up to 350 members — is already more than 60% taken up ahead of its June opening. The Work Project is located on OUE Downtown Gallery’s fourth floor, where the lifts leading to the higher floors of the office tower and the Oakwood Premier serviced apartments are located. “And it’s a high traffic zone,” says Lee. JustCo has taken up 80,000 sq ft on two floors at one of the Grade-A towers at Marina One, a mixed-use development by M+S, a joint venture company set up by Khazanah Nasional and Temasek Holdings. The co-working space at Marina One is scheduled to be ready by 3Q2017 and is already 30% taken up. JustCo’s Kong foresees corporates, including Fortune 500 companies, accounting for 60% to 80% of the members at Marina One’s co-working space, given that it is a landmark mixed-use project in the Marina Bay-Downtown Core area. So far, 60%, or over one million sq ft, of a total of 1.88 million sq ft of office space has been taken up at Marina One, according to an M+S spokesperson. JustCo will also be operating a co-working space of 50,000 sq ft on two floors at UIC Building. Developed by listed United Industrial Corp, the 23-storey, Grade-A office tower is part of a mixed-use development that includes the 54-storey V on Shenton apartment tower. The co-working space at UIC Building is already 40% pre-leased ahead of its opening in June. At least 60% of those who have signed up for the co-working space are big corporates, says Kong. JustCo’s flagship co-working space at 120 Robinson Road takes up a total of 30,000 sq ft across five floors. Members there include bike sharing app company Mobike; Line, a messenger, chat and video call app; and US unicorn company Cloudflare, a content delivery network and security services provider. The other co-working space ­operated by JustCo is at 6 Raffles Quay. Like the one at 120 Robinson Road, it is also fully taken up currently. According to Kong, it took five to six months for the first two co-working spaces to stabilise and achieve 90% occupancy. He expects a similar take-up rate at UIC Building and Marina One. Including the new JustCo co-working spaces in the pipeline at UIC Building and Marina One, the total space operated by the company will be around 300,000 sq ft, estimates Kong. JustCo will therefore have 43% of the total 700,000 sq ft of co-working space coming on stream in Singapore by end-2017. According to Desmond Sim, head of CBRE Research for Singapore and Southeast Asia, the amount of co-working space will increase from about 400,000 sq ft at the end of last year to 700,000 sq ft by end-2017. Says Kong: “The ramp-up of co-working space has been tremendous, especially in the past year, with more new players entering the business.” JustCo has been able to double the amount of co-working space it operates over the past year as it has funding from Paris-headquartered and French-listed private equity firm Tikehau Capital Partners and Singapore-based Pinetree Capital Partners. “They came in about 1½ years ago, and have been very supportive,” Kong reveals. He feels that there is more room for growth in the Central area. Besides the CBD, he sees opportunities for co-working space in Suntec City and the Orchard Road neighbourhood. Regus, the biggest serviced office provider, with a total of 29 serviced offices and one full-fledged co-working space under the brand Spaces, is seeing an increase in demand for hybrid spaces, that is, a mix of co-working and serviced office suites. For instance, at DUO Tower by M+S, Regus will be operating 129,000 sq ft of space at Level 8. About 25% of the space is dedicated to co-working, says Sheena Goh, area director of The Regus Group. “While co-working space will see a significant increase in demand, we do not foresee that it will take a bigger chunk [of space] than serviced offices as yet,” adds Goh. Companies and businesses that still prefer a traditional serviced office are those with stringent compliance requirements and which require fixed desk work configurations, she notes. However, with technology changing the way people work today, Goh expects co-working to “see a significant increase in demand and command a larger market share in due course”. Regus is said to be the largest serviced office provider globally, with more than 3,000 centres in 900 cities. Regional centres such as Jurong Gateway and Paya Lebar Central could be the favoured locations in the city-fringe and suburban areas, given the catchment and connectivity of the regional centres, adds Li. Co-working space operator Spacemob, for instance, is holding a whisky party on April 27 to celebrate the official launch of its second co-working space in Singapore at Ascent, a new development at Science Park 1 by Ascendas-Singbridge. The location is said to be near the Kent Ridge MRT station, key research and tertiary institutions and R&D, high-tech innovation and start-up communities. Spacemob, which received S$5.5 million (RM17 million) seed funding from Vertex Ventures last year, has taken up 14,000 sq ft at Ascent. The space is already 20% filled. Members at Spacemob’s Ascent co-working space include Japan-based venture capital firm CyberAgent, International Organization for Standardization, or ISO, as well as engineering and sustainability firm EcoSolutions. “We’re catering to a market where there was no co-working space offering before,” says Spacemob founder and CEO Turochas Fuad. “We don’t want to go to the CBD and compete with the others.” The first Spacemob co-working space, located at Claymore Hill in the prime Orchard neighbourhood, also occupies 14,000 sq ft. The co-working centre is already filled, with General Assembly as the biggest occupier, taking up 40% of the space. Given its location in Science Park, Spacemob’s Ascent work space costs 10% to 15% less than the one at Claymore Hill, even though the offering is of a similar quality, says Fuad. The space is a mix of private office suites as well as hot desks and collaborative workspace, with a capacity for 250 members. Fuad is also seeing an increase in interest in the co-working space at Ascent from MNCs. Some of them are looking at setting up an innovation or incubation centre with the space, while others are looking at putting their staff there. “These companies want to be in an ecosystem where they can collaborate with others,” he says. Chris Archibold, JLL international director and head of markets, notes: “Companies in the co-working space have the flexibility of scaling up when they need to expand, or reducing staff if necessary. The operators will naturally gravitate to areas where they see critical mass for their customer base.” And he sees that happening in the regional centres. Australia’s largest home-grown provider of collaborative work-space centres, Wotso, expanded to Singapore last August. Wotso, a subsidiary of Australian-listed property fund management company BlackWall, is now operating the top two floors of The Quadrant, a historic circular building at 19 Cecil Street. The Wotso at The Quadrant is a joint venture between BlackWall and Singapore-based firm Springboard Pte Ltd. The total workspace is more than 10,226 sq ft, including the roof terrace. The co-working space is on the fourth floor of the building, with serviced office suites on the fifth floor. The roof terrace, which houses a pantry, is also used as an event space. According to Stuart Brown, CEO of Wotso and BlackWall Ltd, the company had originally been a provider of conventional serviced office space. “When an opportunity presented itself for one of our real estate properties, we branched into co-working,” he says. Since Wotso started in September 2014, it has grown from three to 11 co-working centres in Australia, with most of them in buildings owned by BlackWall. As such, Wotso contributes almost half of BlackWall’s revenue. In Singapore, however, Wotso has a 21-year lease at The Quadrant, says Brown. Meanwhile, co-working operators from China are also coming to Singapore. In January, City Developments announced that it had invested RMB72 million (RM45.3 million) for a 24% stake in Distrii, a co-working space operator in China. Founded in January 2016, Distrii has more than 2,200 members across nine locations in Shanghai. It has a new facility in Beijing and plans to enter Guangzhou and Shenzhen. Distrii’s maiden overseas co-working space will be in Singapore’s Republic Plaza Tower 1 in Raffles Place. It will take up 60,000 sq ft in the office tower and when it opens in 1H2018, it will offer entertainment, F&B and recreational facilities as well. Last December also saw CapitaLand teaming up with UrWork, one of the biggest co-working operators in China. UrWork will open two co-working centres in CapitaLand’s malls in China, namely Capita­Mall Minzhongleyuan Mall in Wuhan and CapitaMall Wangjing in Beijing. UrWork will also open a co-working centre at CapitaLand’s new Funan in Singapore, which is being positioned as “a mall of the future”. 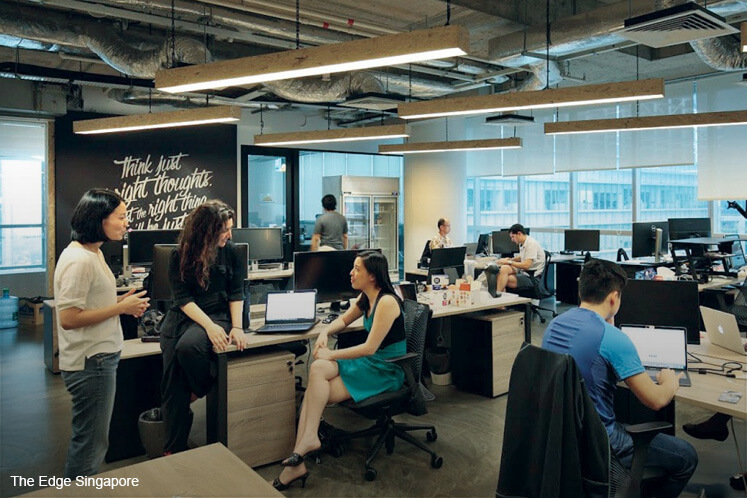 For now, the co-working market in Singapore is still at the “experimental stage”, says Peter Andrew, CBRE senior director of workplace strategies. Co-working businesses are exploring a diversity of space and work experience solutions. “It’s not yet clear what the dominant solutions will be in the future,” he says. JustCo is also not satisfied with being just a local player. The group already has two co-working centres in Shanghai. And it has plans to open a co-working centre in Jakarta and Kuala Lumpur by year-end, with Bangkok, Ho Chi Minh City and Manila in 2018. Within the next two to three years, JustCo will have a total of 2.5 million to three million sq ft of co-working space in the region, says Kong. Another co-working operator that has regional ambitions is Spacemob’s Fuad. The first Spacemob outside Singapore will be in Jakarta. It is slated to open in June. Spacemob will have 30,000 sq ft of space in Gama Tower, the tallest skyscraper in Indonesia at 69 storeys. And it will eventually scale up to 100,000 sq ft. There is a pipeline of Spacemob co-working centres in Ho Chi Minh City and Bangkok scheduled to open by year-end. The partnership with Ascendas-Singbridge will also help Spacemob expand beyond Singapore. “We have a strategic agreement to enter certain locations with them,” says Fuad. It looks like co-working is on a growth trajectory for now. And it is a bonus for space users such as Mercury PR’s Lee. “I’m looking forward to moving into the co-working space at The Work Project, with its great location, great community and Omotesando Koffee,” she says. This article first appeared in The Edge Property Singapore, a pullout of The Edge Singapore, on May 1, 2017.